So often we watch the news and see hundreds of people die from natural disasters. We have seen countries like Haiti ravaged by earthquakes, places like Indonesia destroyed by tsunamis, cities like New Orleans washed away by hurricanes, and most recently, towns like Joplin, Missouri blown away by tornados. We see events like these so often and are even at the point where we are almost always expecting another one to happen. However, natural disasters are not the only mass killers and destroyers that hit the world. Europe is experiencing an outbreak of E.coli at the moment that is sweeping the continent. As of Monday, the death count is already at fourteen innocent people. Hundreds more have become ill and are in poor condition after the outbreak. It is believed that the E.coli is infecting cucumbers that are being distributed throughout Europe from Spain. According to the European Union, German officials have traced the outbreak to the Spanish towns of Malaga and Almeira. More cucumbers from Denmark and the Netherlands are also being looked into. In Italy and Austrian, all foods coming from Spain are being inspected to make sure they are safe for the innocent citizens of each respective country to consume. In Russia, all imports of select vegetables from both Germany and Spain have been outright banned for the time being. So far, in Germany alone there have been ten deaths. 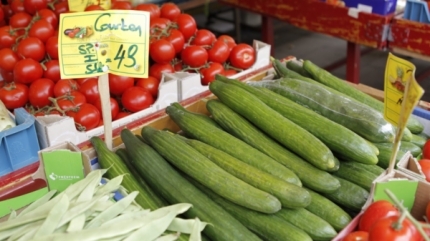 According to the European Union, it is unclear where the cucumbers were infected. Because of all the stops the vegetables make between their location of harvesting and their final destination and all of the people who handle them, it is difficult to pinpoint when the E.coli contamination occurred. Officials in Spain are adamant that the contamination did not start in their state. They are demanding that German officials, as well as the European Union, prove their determinations that the outbreak did in fact start in the Spanish nation. Whether or not the outbreak began in Spain or occurred somewhere on the way to the final marketplace destination, the point of the matter is that there is an outbreak that is killing people and making hundreds more ill. This might not be a hurricane, earthquake, or any other natural disaster, but this is an important situation where innocent people are losing their lives and others are having their health threatened.